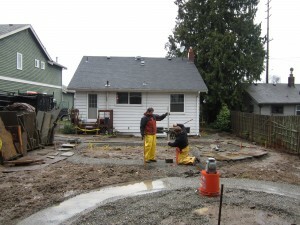 A wet week on top of a wet week didn’t stop major progress on this garden currently under construction in Maple Leaf. This crew from Exteriorscapes will be finished with the hardscape in a few weeks and we’ll be onto the plants in April. Since we’ll still have wet weather then, the plants will have a few months to settle into the moist soil before warmer dryer weather arrives in the summer. All plants like that – trees especially. This cycle works well if we get going with some ideas for the design during the spring and summer which provides an opportunity to break ground in the fall. While there are some days when construction doesn’t happen during those months, winter weather just isn’t a deal breaker most of the time in Seattle. Building in the winter means having the garden ready for spring and summer use which is a big bonus. Let’s make a plan. Choose hourly or fixed-fee services.